Download, study and learn how to correctly read Half-Mile’s PCT maps. The resource provides essential details of the trail including coordinates, known camp sites, water sources and elevations. A critical tool for anyone hiking the PCT. A cinch sack makes a good “pillow” cover – but only if you put some clothing over it. The sack was slippery and kept slipping against the sleeping bag. A sweatshirt was a perfect solution. The tent has color coded tags that match up with the foot-print tarp. REI should have told us. Patti’s convertible pants have color-coded zippers, too! And front pockets! It took two days to realize this. Cross the road and stay on the trail. We keep finding roads and wanting to go down them. It gets us lost every time. 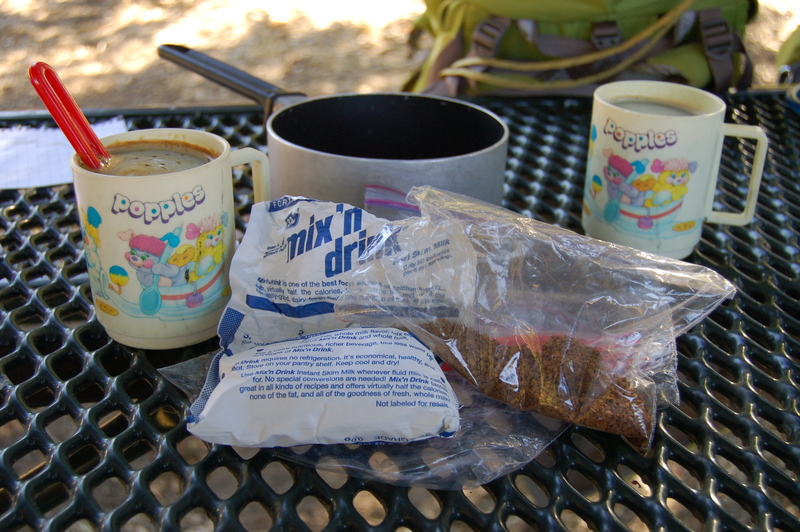 Even freeze-dried coffee with powdered non-diary creamer tastes delicious out on the trail, we don’t care what Starbucks says. A luxury we can’t do without. PCT coffee. We picked up the mugs at a garage sale many years ago just for camping. We’re not sure what Popples are. Do you? Bags of dehydrated vegetables and crackers make lousy trail food. But tuna makes for an unexpectedly excellent lunch. Tuna can be picked up in packets now. Mayo and relish can be picked up at a number of fast food places also in packets that don’t require refrigeration. Mixed together, you have a meal as close to fresh as we can think to make. Excepting maybe fresh fish. Maybe when we get further north we will try to fish. If you wash your favorite hat between hikes, check the size before you go back on the trail. On the trail is not a good time to find out your hat shrunk. Quality Ziploc is a good investment. We hate hills, rocks and gnats. right arm,, farm out and groovy. Did ya have to keep your food hoisted up a tree to keep critters from getten to it. The bear-vault is solid enough and sealed such that odors don’t escape, so we didn’t need to string our food up. In fact, on much of the trail, they no longer suggest doing that. In Yosemite, they won’t even allow it. Great post. I’m very curious about the lessons the trail will teach us this year. My doctor wants to put a port in. Will it interfere with my ability to carry a backpack? Hi Sandy. I brought my backpack in with me before the procedure, just to be sure. He marked where the straps landed on me and placed the port a little closer to midline of my body. He said where it usually goes is “under the dress line” so it doesn’t show as much. It was more important for me to hike than cover my port for strangers. My chest strap was adjustable so that wasn’t as much as issue with me. But if it is for you, be sure to have that in place too. It was no problem for the doctor to put it a little away from where he normally did. I’m SO glad I did it this way. Because I am thin, the port really stuck out and that would have been a big issue hiking. I hope all goes well for you and you are out in the trail soon! And thanks for reading! Thanks so much for sharing. I’m small and thin too so I was worried it would get rubbed. I’ll bring mine in to show!